Alistair MacLeod took thirteen years to write this book, his first novel. He was sixty-four when it appeared. When he started to write it he was already a world-famous short story writer, on the strength of just two collections of seven stories each. People in Sydney, Australia, just like people in Sidney, B.C., and people in Sydney, Nova Scotia, were all pleased and excited to hear that Alistair MacLeod, the great short story writer, was finally at work on a novel. In my book, Stories About Storytellers, I tackle the legend that has grown up around my efforts to extract a finished manuscript for this long-awaited book from Alistair. It involves a flight to Windsor, a bottle of single malt whisky, and a friendly visit that Alistair has described as “a home invasion.” Though I was certainly playing the role of greedy publisher, I did succeed in wresting the manuscript from him, and we worked together to edit and publish it. As you know from reading the novel, Alistair’s writing is so precise, and the rhythms so perfect (I call him “The Stone Carver” because his words are so slow to emerge, but so eternally right when they do appear) that my role as editor was almost unnecessary, except in one area. Alistair had worked on the manuscript for so long, in so many places and so many typewriters, that he had neglected to divide the book into chapters. I took on that editorial role, with Alistair’s blessing, and I’m proud to say that when we saw the first proofs of the book, we agreed that I had got it right — with the exception of one paragraph that had to be moved back to the previous chapter. To help make this come true, it was essential to give the book the right “look,” both inside and outside. Inside, for example, I realized that with forty-three chapters in only 283 pages, to start each chapter on a new page would be disruptive to the reader’s eye and would make the book seem padded. Hence my decision to allow a six-line space between chapters, and to mark each chapter opening only with a simple numeral set against a Celtic design. Did you notice the chapter breaks? (An editor and designer really hope for the answer “no,” implying that everything seemed natural.) And if so, how did it affect your reading? As for the look of the book cover, how do you go about getting the perfect “look”? A dramatic photograph (or an original painting) of a lantern set beside a black hole in the ice? A simple pattern of the MacDonald clan’s traditional tartan with the book title and the author’s name superimposed? Or the cover we did choose, a moody, misty shot of a coastline that could be either Scotland or Cape Breton? What do you think? Did the brilliant designer Kong Njo and I choose well? What might you have done? 2. The conversational tone is set right at the start, in the very first phrase “As I begin to tell this,” and a couple of pages later the link with the oldest traditions of storytelling is made clear: “The 401, as most people hearing this will know . . .” Does Alistair MacLeod succeed in making this reading aloud style work, or did you find it artificial? Or did you simply stop noticing it? 3. Did you notice how much of the book is told in the present tense? Each one of the Toronto sections, where the chapter often opens with the word “Now,” is told in the present, as our narrator visits his brother Calum and goes out to get him more to drink. How does this help Alistair to set off the current Toronto sections from the family history chapters that come to dominate the book, after the family scene is set? And how does the vivid picture of Calum’s destitute current state affect the way we read the family storyline from the old days? 4. For me, one of the book’s greatest achievements is how, through the stories of this one Cape Breton family, it blends Scottish and Canadian history so seamlessly. 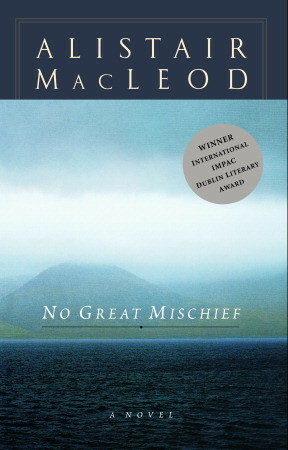 One leading Scottish literary critic, Robert Crawford, called No Great Mischief “a great Scots-Canadian novel by a writer nurtured by the Gaelic-speaking community of Cape Breton.” A major Scottish historian, James Hunter, noted that Alistair’s “literary world is one that draws no sharp distinction between the Scottish and North American components of the Highland experience.” So, for example, for us in the book the battle at Culloden leads to the battle at Quebec, with General Wolfe cynically speaking of his old enemies, the Highland troops, and giving Alistair a great book title. Did you find that the Scottish history was well enough explained for you and was not a barrier to you in reading? And did you find that the brief quotes in Gaelic (“the gille beag ruadh,” or “pog mo thon,” a useful phrase) were translated soon enough and added authenticity to the story without obstructing your reading? 5. The narrator (the gille beag ruadh) is now distant from his Cape Breton roots, as a soft-handed orthodontist in Windsor, Ontario. He is ironic, even almost embarrassed, about his own occupation and its link with human vanity. Why do you think Alistair chose an orthodontist as his narrator? And did you notice the interesting dental link with the incident when young Calum is suffering in the fishing boat from an infected tooth and uses the horse, Christy, to pull out the tooth. What did you think of that scene, and of the other scenes with the faithful Christy? 7. One of the great themes here concerns the dogs who served the MacDonalds down through the years. (“It was in those dogs to care too much and to try too hard.”) The Calgary sister says, “Here am I, a grown woman, spending my time worrying about the decisions made by a dog.” And the narrator contradicts her, saying, “You know you are doing more than that.” What would you say she is doing? And what was your favourite dog story in the book? 8. It’s interesting to see how Calum, the oldest brother, who is not even named in the early chapters about the death of the parents, emerges as a natural leader. We see it in scene after scene, whether it’s in taking on the RCMP, or negotiating with the mining company, or staring down a security guard, or tackling Fern Picard. What do you think of Alistair’s comments on the goose that leads the migrating skein at the head of the V and his musings on the role of the Herring King, leading his followers to their fate? Or of Calum’s revealing comment that if he had been on the ice with his parents that night he might have saved them? As we drove towards home we waved again to the people on the streets, but it seemed they only half-raised their hands and looked at us too intently. When we drove into the yard there was a knot of people gathered about the doorstep and there was also smoke from the chimney. Someone who knew the house had raised the back window and gone in and started a fire and opened the doors from the inside. The red-haired Alexander MacDonald had been killed that afternoon, the people said. Did this turn of events hit you hard? What impact did that death have on our narrator’s life? 10. Another of my favourite scenes is one that I chose when, in Alistair’s absence, I had to give a reading from No Great Mischief on his behalf. It’s the one in which the sister from Calgary visits Moidart, the remote part of Scotland that her family left 200 years earlier. And did you notice Alistair sets up the dramatic meeting on the beach, by changing the style: “Had to take off her shoes and hold them in her hand. . . . Went to another spot. . . . Listened to the crying of the gulls”? “You are from here,” said the woman. How did this scene affect you? And do you believe, from your own experience, that national characteristics can continue to reveal themselves down through the generations to careful observers of faces? 11. That scene perhaps resonates most strongly with readers who have a Scottish family background. But one perceptive critic, David Williams, in an essay entitled “From Clan to Nation” has pointed out that Alistair’s sympathies in this book extend widely, and embrace many different people. He writes, “It is a print creation of the imagined nation, of that dreamed home in the book where Highlander and Quebecois may truly live in harmony with Ukrainians, Mennonites, and migrant workers from Mexico. It could nearly pass for a long-lost map of the peaceable kingdom.” Do you agree that the book is embracingly generous in its approach to other cultures, even the distant Zulus? 12. Janice Kulyk Keefer, in her essay “Loved Labour Lost” writes of Alistair’s concern for “those who perform authentic, necessary, and demanding physical labour. . . . No Great Mischief is a work that speaks across cultural and social borders, in the language of labour, and of love.” Do you agree that the book is sympathetic to many types of manual workers, from hard-rock miners all the way to families picking their own fruit? 13. Many men have spoken specifically of how much they enjoyed No Great Mischief because it deals with unusual and unglamorous masculine subjects, like the day-to-day work of hard-rock miners drilling underground. Do you agree with their criticism that the world of physical work is too rarely treated in modern fiction? Can you think of other examples to shoot down that theory — outside Alistair MacLeod’s own fiction, which often deals with fishing or mining or other tough tasks that he knows at first hand? 14. What did you think about the role of music in the book? In the restricted world of the mining camp in the northern Ontario bush, there’s the sudden appearance of James MacDonald, the Métis fiddler, playing traditional tunes, and being kindly treated. And there’s the impromptu fiddle concert when the Quebecois guys and the Cape Breton men get together, such a striking scene that Senator Laurier LaPierre once admiringly read it into Hansard. I made use of the music that runs through the book; when at the sales conference to launch the book to our assembled sales force I stopped talking and played the tape of Puirt a Baroque from Halifax playing “Niel Gow’s Lament,” the tune that was featured at the funeral of the red-haired Alexander MacDonald. And the sad, slow music of the fiddle was worth ten thousand of my words. 15. The three grandparents are very different. There’s the carefree, even bawdy Grandpa (“I know a warm place to put it”). There’s the careful, precise, even prim grandfather who died reading a history book. And there’s Grandma, the rock at the centre of the family, with her store of homespun wisdom (“Blood is thicker than water”). Who is your favourite? 16. What do you make of the role of the American cousin, the draft dodger from California? His role as a thief brings on the fatal fight, and then he disappears. Is his nationality important? 17. What did you think of the slow build-up of the rivalry with Fern Picard’s men, and then the savagery of the fight that changed everything? Part of Alistair’s skill in telling it, I think, is that he has the narrator in the fight, rolling around on the gravel grappling with his opponent, yet able to give a picture of the whole scene, as if he’s both inside and outside the fight. 18. Did you notice that the shortest chapter in the book (Chapter thirty-nine) deals with Calum’s murder conviction? What was the effect on you of such a short, three-sentence chapter? The chapter ends, “The judge, noting what he called the accused’s long history of violent transgressions, said that he hoped the sentence would serve as an example for those who chose to break the law.” Were you tempted to protest, “No, no, it’s not like that. You don’t know Calum the way we do”? 19. For anyone with elderly relatives or friends suffering from memory loss, or worse, the saddest scene in the book may well be the visit to see Grandma in the nursing home. As I read it, I was suffering along with the narrator, until the paragraph “I can no longer bear it. ‘He was my grandfather,’ I say. ‘Grandma, it’s me, gille beag ruadh.’” Were you moved by it, and by Grandma’s scornful rejection of this “preposterous” idea? The scene still brings me to tears, after dozens of readings. And you? In my book, Stories About Storytellers, you’ll find that I have a long, affectionate chapter about Alistair MacLeod. The subtitle reads “Teacher, Fiction Writer, Stone Carver, and Dancer.” It tells of the worldwide success that greeted this novel, and Alistair’s collected stories that I then published under the title Island, to great acclaim. And it tells about my encounters with Alistair MacLeod, the man. All of us are better when we’re loved. Are you reading along with the Storytellers Book Club? Share your questions and observations about No Great Mischief with Doug in the comments below. Our small book group read and loved this novel. I linked your essay to our blog. One interesting note on the book is that it was clan loyalty that ultimately leads to the mining Macdonald’s downfall. Their parents said it was their responsibility to try and get their American cousin a job. Although he is a double first cousin living away from clan in the states he has not kept the same values as the clan in Cape Breton. He steals from Fern Picard and lies about it. The clan backs him up when he says he is telling the truth and causes the fight and the resulting problems to occur, ruining the lives of so many of the Macdonalds who were doing well financially and would have gone on to financial security..